Proprietary Name: Daytime And Nighttime Cough And Chest Congestion Childrens What is the Proprietary Name? Non-Proprietary Name: Dextromethorphan Hbr, Guaifenesin, Chlorpheniramine Maleate What is the Non-Proprietary Name? 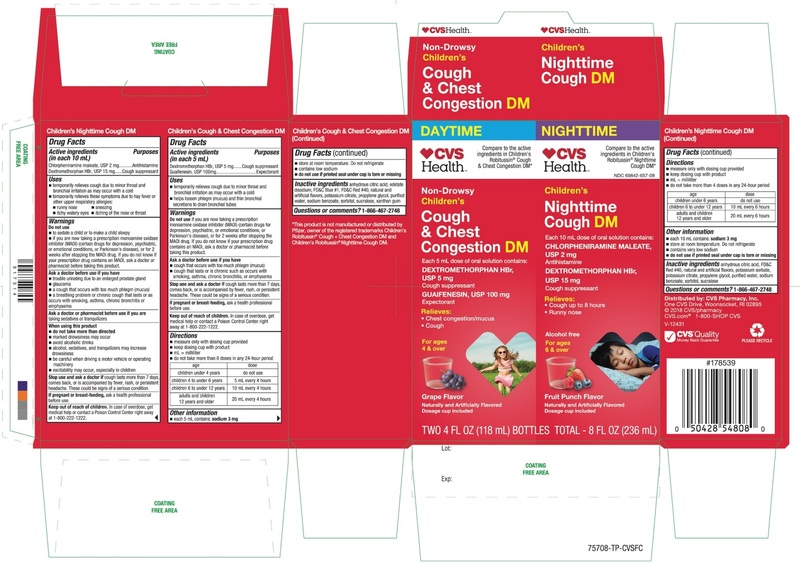 Daytime And Nighttime Cough And Chest Congestion Childrens with NDC 69842-657 is a a human over the counter drug product labeled by Cvs Pharmacy. The generic name of Daytime And Nighttime Cough And Chest Congestion Childrens is dextromethorphan hbr, guaifenesin, chlorpheniramine maleate. The product's dosage form is kit and is administered via form. DAYTIME •If you are now taking a prescription monoamine oxidase inhibitor (MAOI) (certain drugs for depression, psychiatric or emotional conditions, or Parkinson's disease), or for 2 weeks after stopping the MAOI drug. If you do not know if your prescription drug contains an MAOI, ask a doctor or pharmacist before taking this product.NIGHTTIME •to sedate a child or to make a child sleepy •if you are now taking a prescription monoamine oxidase inhibitor (MAOI) (certain drugs for depression, psychiatric or emotional conditions, or Parkinson's disease), or for 2 weeks after stopping the MAOI drug. If you do not know if your prescription drug contains an MAOI, ask a doctor or pharmacist before taking this product. DAYTIME •cough last more than 7 days, comes back or is accompanied by fever, rash, or persistent headache. These could be signs of a serious condition.NIGHTTIME •cough last more than 7 days, comes back or is accompanied by fever, rash, or persistent headache. These could be signs of a serious condition.